The evening and night of the 31st October which we call Halloween, is a magical time celebrated by people of all faiths these days, and none more so than by children who delight in dressing up as ghosts and skeletons going from door to door trick or treating. Carrying hollowed out pumpkin lanterns and singing ghoulish songs they are rewarded for their efforts with candy and sometimes a few coins to spend the next day. A lot of the meaning behind the history of Halloween has been lost as we celebrate our modern version but its roots are still well known and make a great story to tell children before they set off on their mission to frighten and entertain. 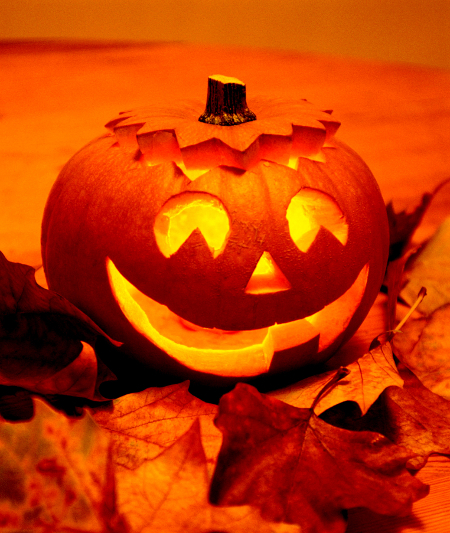 Originally Halloween was known by the Celtic name Samhain, which some historians believe might be how we get the word ‘summer’. Thousands of years ago the Celtic people of Western Europe, particularly the British Isles and Western France believed that on the last day of summer, roughly the same day as our 31st October, the barriers between the world of the living and the kingdom of the dead would open allowing spirits and saints to pass amongst the living. Evil spirits would go from door to door frightening the people, and anyone unlucky enough to be out had to hurry back before the spirits caught them and took them back to the kingdom of the dead. It was a terrifying night and to protect themselves the people would turn to the druids who were the priests and protectors of the Celts, and would light great fires and offer sacrifices to appease the evil spirits until the barriers had closed again the next day. The gods and other good spirits would often battle the evil spirits but they needed the help of the living world to keep the evil spirits from tearing down completely the barrier separating the two worlds. Sacrifices of animal bones were thrown into the fire leading to them being called the bone fires, which is how the bonfire came to be part of the history of Halloween. In return for helping the gods fight the evil spirits on Samhain night, the gods would make it possible for the druids to see the future and predict the weather and the health of their king for the next year, so allowing the Celts to prepare their seeds or stockpile foods to carry them thru the seasons. The druids would also recite poems to the sun who they believed was a god so that it would return the following year and warm the earth. The winter months were cold, dark, and nothing much would grow. Celtic people of the time also believed that if the sun didn’t return they would be too weak to help the saints fight the evil spirits, and that ultimately the devil would win and the earth would perish. After the Romans invaded the Celtic lands many of the Celts converted to Roman pagan rituals but still kept many of their own Celtic festivals, Samhain being one of these, however the celebrations were merged with Roman festivities that happened at around the same time. One of these was the festival of Pomona, the Roman goddess of fruit and trees. Pomona’s symbol was the apple, which gave rise to the tradition of bending over a barrel and trying to bite the bobbing apple with our hands behind our backs, a tradition which has survived into the 21st century in the British Isles and is making a comeback in other parts of the world that celebrate Halloween and it’s history. When the Christian faith finally found it’s way to Ireland and the people converted to the Roman Catholic church from their traditional Pagan beliefs, many of the old celebrations and feasts became Christian celebrations, and Samhain was no different, becoming instead All Hallows Eve, also known as All Saints Day. Sacrifices were no longer allowed, and instead of druids reciting poems, monks and priests would chant hymns honoring the Saints of Christendom. The Saints would be asked to keep looking over the people, and in some masses are begged not to forsake the living and continue performing miracles. The first of November, known as All Souls Day, is a day of remembrance for the dearly departed and in many parts of the world is a day when families will visit the graves of their loved ones to place flowers and tell them all that has happened in the world for the last year. It is a time of celebration to many rather than a time of sadness. In the 19th and 20th centuries Halloween has changed from being a religious celebration to an annual holiday mostly for children who dress up in costumes and wander from house to house singing songs in small groups. 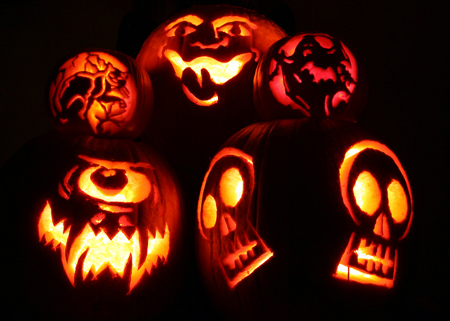 A favorite tradition that started in the USA and is now spreading to other parts of the world is the carved pumpkin lantern with a scary face and a candle inside known as jack o’lantern. The story behind jack with the lantern is another old favorite, about a man in Ireland who had stolen from the villagers and as he was being chased out of town he met the devil who had come to claim Jack’s soul. Jack managed to strike a deal with the devil, the villagers souls in exchange for Jack’s freedom. The devil would turn into a silver coin that Jack would give to the villagers as payment for his crimes, and then when the villagers were tucked in their beds the devil would return to normal form and take the villagers one by one. Jack cunningly put the coin into a purse that also contained a cross, thus trapping the devil and allowing Jack to escape. Many years later Jack died but for his sins is turned away from Heaven, but the devil still remembers his treatment at Jack’s hands and forbids him entrance to Hell, thus Jack was forever doomed to wander the dark nights. the devil’s parting gift to Jack for besting him is a sliver hot coal from the fires of hell, which Jack places in a lantern to aid his travels. The pumpkin lantern we use today reminds us of the deal Jack did, and originally was made from any large vegetable that was available, which in the USA was a large orange or yellow pumpkin. The top is cut off and the flesh scraped out then a face carved into the side. The light from the candle reflects off the yellow flesh giving the lantern a suitably scary look.